These days, savvy travelers are onto the fact that exotic and exclusive destinations are not only found in the deepest of jungles, the most remote mountain tops, or on isolated and long-deserted (except for that solitary five-star resort) islands. More and more, adventure is found in more urban destinations, particularly those that bring with them a new sense of safety and sanity, the absence of which for many decades made them a no-go. Pest, to the east of the Danube, bustles with action and the trappings of more recent history, while Buda, on the other side of the of the river, is punctuated by Buda Castle, a European icon, particularly at night, when it — and the rest of the city — is breathtakingly illuminated. Save for a few hours of fighting tourists in Buda, you’ll want to dive into Pest. eras with memorials and blunt reminders. The Shoes on the Danube is a haunting memorial to victims of the Holocaust. Similarly, the House of Terror Museum is a chilling representation of the horrors of two terror regimes that came to an end less than 30 years ago. They are both must-sees. The Budapest baths are another major draw. Szechenyi Bath is the biggest and most popular, and is one of the biggest natural hot spring spa baths in Europe. If soaking with a hundred or so other people trips your trigger, these warm medicinal waters will be manna. 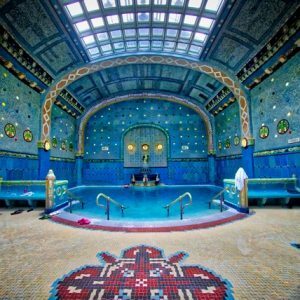 Even if communal bathing isn’t your thing, these pools of history are worth a look for their artistic flourishes. If you’re a savant of the bar scene, you’ve no doubt heard of the city’s famous “ruin bars,” which are still the rage more than a decade after rocking the indie scene. Built in Budapest’s old District VII neighborhood, the old Jewish Quarter, the ruins are actually abandoned buildings, stores, and other structures that have been become a mecca for imbibers. There’s not much else that’s ruinous about Budapest and, in fact, it has become impossibly chic over the past few years, with iconic brands smoothing some of the edges. Ritz-Carlton has taken the lead in this category. 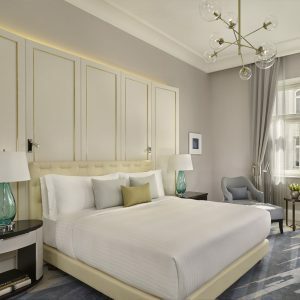 Located in the heart of the city, the five-star hotel is not unlike other city structures in that it brims with history. Constructed in 1914 as the headquarters of an Italian insurance company, the building has seen many incarnations, including having been the former home of the city police. As you might imagine, the clean stoicism of insurance and law enforcement have left their architectural mark on this building, and the Ritz-Carlton has succeeded in blending the best of the past with exceptional embellishments. Luxury is the property’s top note now, and the space blends traditional elegance with bold, contemporary design. 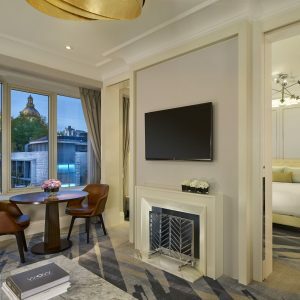 The location is superb, with most of the 200 or so guest rooms and suites offering spacious, residential-inspired layouts and spectacular views of the city’s picturesque landmarks. As can be expected with any Ritz-Carlton property, the luxury bedding will make you think twice about ending your night’s slumber. 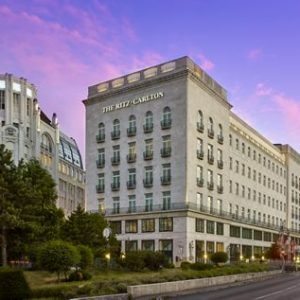 When you do, however, you’ll be pleased to find that your walking tours can be easily begun within minutes from the hotel: iconic attractions including the Danube, St. Stephen’s Basilica, shopping on Andrássy Street and the spectacular Parliament building are blocks away. Here’s a pro tip: you must book your tour of Parliament on-line and days in advance. You’ll be disappointed if you miss this jewel of the city. One of the best dining options in Budapest is located on the hotel’s ground floor: Deák St. Kitchen. Here, you should commit to a Hungarian-inspired dish crafted from local ingredients. Kupola Lounge, set beneath an awe-inspiring stained-glass cupola, serves a typically delicious European breakfast and cocktails later in the day. While considering your poison, be sure to check out the local wines. Hungarian wine is exceptional, inexpensive, and pretty hard to come by outside the region. Even your room’s honor bar selection (at less than $20 per bottle!) is irresistible. Inspired by the local baths, the Ritz-Carlton Spa, with treatments and products from the renowned ESPA, a 24-hour fitness center and a striking indoor pool set beneath a glass roof, is predictably more formal and private than the group plunges elsewhere in the city. 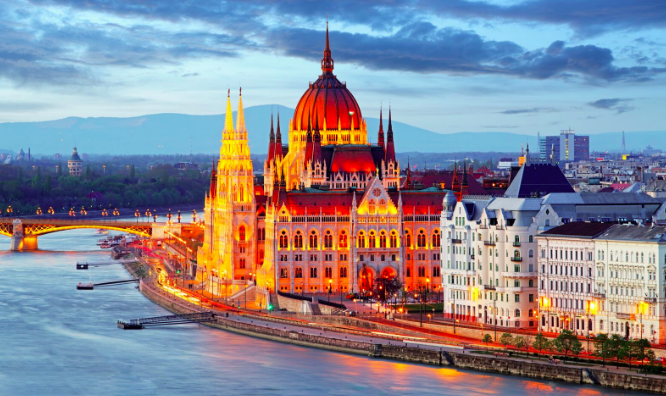 Now with accommodations that match the centuries-old grandeur of Budapest, this once overlooked and hard-to-visit city is rocking the world of travel. Get a first class seat now and relish the opportunity to discover anew.